A Clean House. Done Right. Guaranteed. All fall and winter, mildew has been growing . . . creeping . . . discoloring your house. Right now everyone can see the ugly, murky mildew stains camouflaging your house. But you are busy. Preoccupied with work. Aggravated with the difficulties that you have to deal with every day at the office. Tired. Who has time or the energy to even think about cleaning your house? 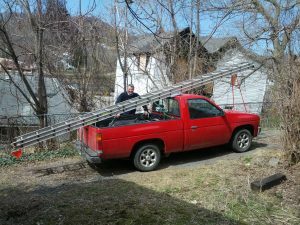 And then hauling ladders around the house, much less getting to those seemingly unreachable high points? For you, my friend, I’ve got a SOLUTION! Your local neighborhood pressure washing guy here . . .
Last summer or fall, you may have seen my red truck in your neighborhood. Or you might have caught a glimpse of me hanging off the side of your neighbor’s house 32 feet off the ground, pressure washing or scrubbing a gutter by hand. I know it’s hard to believe, but 2019 is here. Now is the time to clean up your house and get it ready for the spring and summer. Why it generally takes me two to three days to clean your house. Instead of relying on a long, telescoping pressure washing wand, working only from the ground, I put up ladders to get up close to the side of your house. So that means I visually inspect your entire house for mildew. No guessing that the mildew is all gone. So, to help me with this, I use a lot of different ladders . . .
And there’s even a HEAVY 40′ to make sure I can get up to the highest areas to work. While I’m up there, I carry a bunch of sponges and two types of cleaner with me to clean the tough areas of your house by hand, if necessary. A pretty popular add-on item is exterior window cleaning. Here’s how I clean your windows. I scrub the glass and window frames with a sponge and cleaner. And then gently rinse away the mess with water. (You wouldn’t believe the dirt and debris that can get lodged in those window frames). Then I clean and rinse the screen frames. When the windows are dry, I follow up with glass cleaner and paper towels to give them one last cleaning. If you want your interior windows cleaned, I can do that too! I’ll Bet . . .
By now you’re probably thinking I’m a detail guy. “David does an excellent job! Very detail oriented, thorough, and has fair prices for the work he does. Highly recommended by many people in The Village!” — L. Johnson, Homeowner. A long time ago, I had a manager who stressed presentation . . . how the store looked when a customer walked in. Similarly, think about how just a few of these add ons could set apart your house and sharpen its curb appeal. While not exactly the red carpet that the president gets, a clean walkway framed by a freshly trimmed lawn I’ll bet comes real close. You’ll want to linger a bit . . . just to enjoy the experience. Include your patio and you can enjoy a relaxing, fresh environment. If you have a deck you’re planning to stain later this year, you’ll want to get the wood prepped and ready. You also might want to clean your deck furniture. Clean your gutters, avoid clogging, and an overflowing waterfall when it rains. Instead be sure water is going into your downspouts. If your yard is fenced, cleaning your fence will add the finishing touch to your yard. Imagine, no more driving away to work in the morning thinking what an embarrassing eye sore your house has become. In fact, power washing might just be able to do more than clean up your property and increase it’s curb appeal. As I show you next . . . . I want to thank you so much for pressure washing my house. I had weeds growing in my gutter. It was a mess. Water was not going down the drain spouts. Instead the gutters were overflowing. The sidewalk was grey. Mold and mildew were all over the house. I hated coming to the house at night. It was depressing. I was embarrassed to look at the house in the rearview mirror as I left for work in the morning. You pressure washed my house, cleaned my gutters and sidewalk. The house is bright and cheerful. I feel like my house has moved up a notch and now stands out. This person’s experience shows you the power of pressure washing and how transformative it can be. It can be more than an investment in your property, it can be an investment in yourself. Below, are a few more quick reasons to pressure wash your house, and then listen to what your neighbors in the local area are saying after getting their houses cleaned. Spend your time doing what you value most. Leave it to me to climb the ladders and get wet and muddy. Set apart your house from the competition. Give it the winning edge in today's real estate market. Impressions and character matter. Make a statement with your house. Mold creates a slippery surface hazard and may lead to costly bills. Keep your property safe, clean, and attractive. It's a pleasure and a joy to return to a clean house everyday. You'll feel better about yourself. The paint that's protecting your house gets enough wear without having to compete with mold, dirt, and mildew. “David does an excellent job! Very detail oriented, thorough, and has fair prices for the work he does. Highly recommended by many people in The Village!” . "We hired David Mueller to power wash and paint our house based on the recommendation of a friend, who said that he did excellent work and was affordable. David did not disappoint. He is thorough, trustworthy, and his work is truly outstanding. He was very generous to work us into his schedule to help us get our home ready to put on the market and we ended up with a full price offer on it the day after he finished! I can’t say enough about how much we appreciate his hard work and commitment to excellence." "David Mueller is well-known in the community for his high-quality work. When you hire David, you know the job is going to get done correctly. David did a superb job pressure washing my house and made the 30-year-old siding look like new. He washed my front porch which is brick with white wood work, and got it clean without chipping any of the paint or brick. I really appreciated his careful attention to detail and thoroughness, which was well above and beyond the typical call of duty. David made me really glad that I didn’t try to do it myself! I would definitely hire him again." “We highly recommend David Mueller for pressure washing and we will absolutely hire him again the next time we need to get the job done. He efficiently works with great attention to detail and care and takes pride in the transformation of the house, making us very pleased with the results." "David Mueller has worked for me for many years. He has painted and stained my front porch and power washed my house twice in the past 12 years. I have recommended him to many of my fiends who have also used his services. I have always found his work to be superior and I have no problem sharing my completely satisfying experience with his work and will call him again if the need arises." "I hired David on the recommendation of several neighbors. David did an excellent job! Our house exterior looks as good as the day we bought it. David is very thorough, his pricing is fair, and we couldn't be happier with his work!" "Numerous people in our 200+ home neighborhood have employed David and everyone recommends him. He is a fair, diligent and meticulous worker. His prices are very reasonable. If you want the job done right, hire David." "We hired David Mueller to patch up and paint two bedrooms in our home. We also hired him to pressure wash the siding of our house, our patio, and our driveway. His work was alway done carefully and thoroughly. He took an extra day to work on our concrete driveway and made it look like it was new again. I feel comfortable recommending him for this kind of work." Dave Mueller pressure washed our house in the middle of June, 2015. Our house is a two story house with vinyl siding. He did the pressure washing, window and screen cleaning. He applied exterior bleach, soap and water, on the siding and our deck to kill mildew.. He did an excellent job. He did a very careful and thorough job. The siding looks like it is new. He also cleaned up the work area after he was done. I highly recommend Mr. Mueller for this type of work. Why Book With Us Today? Get it clean and enjoy it today! Do what’s important to you. Save yourself back pain, dirty clothes, or worse. Who wants to pressure wash on their day off? Pressure washing is not fun. Pressure washing can be dangerous. Yes! I’m Ready To Get Started With My Pressure Washing Project! Please enter your contact information below or pick up your phone and call me at 540-250-7843. Tell me about your project, and I’ll schedule a time to look at your project and give you a written proposal exclusively designed for you!